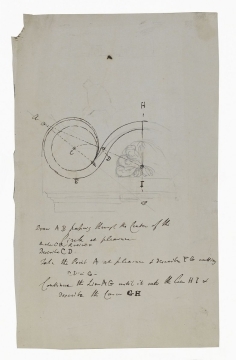 Jill Lever writes that Drawings 30 to 32 are three sheets of drawings for acroteria made by Dance presumably to assist Soane in his designs for the Lothbury wall. The inscriptions and the pencil additions appear to be made in Soane's hand. 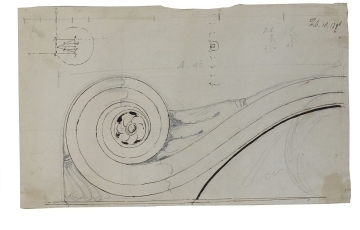 Soane notes in his diary on 21 February 1796 that he recently called on George Dance (1741-1825) specifically about the entrance design. The executed attic was more elaborate than Dance's designs, having twin double scrolls with florid paterae and anthemion and a large scallop shell in the centre. A trial sample can be seen near the top of the north side of the Monument Court of 13 Lincoln's Inn Fields, London (Sir John Soane's Museum). Dance's design, in drawing 32, was for a segmental pediment with a single scroll on each side or a triangular pediment with a circular antefix on each side. 2003, catalogue .4,p. 350). 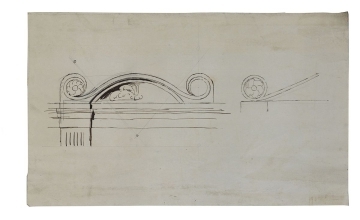 Dance later used his pediment and scroll or antefix designs to crown internal doors at, for example, Stratton Park, 1803-07 (Lever, op.cit., .119) and they can also be found in Soane's later work, in particular, for monuments.